according to the Wall Street journal today, Hillary Clinton was formerly a board member of Wal-Mart. that was the first I’ve heard of this. i did some digging and, sure enough, Mrs. Clinton serves on the Wal-Mart board of directors from 1986 to 1992 (not long before she became first lady). During those six years, Wal-Mart was one of the fastest growing companies in the world. This experience must have been one that us useful to Senator Clinton. This entry was posted in Current Affairs on April 9, 2008 by auren. So there was big news today … the Wall Street Journal reported that the International Energy Agency presented a paper to the G-20 meeting in Melbourne on global energy demand. The paper predicted that global energy demand will grow 50% in the next 25 years. 50% sounds like a huge number, but over a 25 year period it means it is only growing 1.63%/year. that number doesn’t sound like it would be insurmountable to deal with. it is much less than the global economy is predicted to grow. couldn’t a potential plan of conversation and new energy sources deal with this increase in demand??? This entry was posted in Current Affairs on November 20, 2006 by auren. Peter Thiel penned a very thought-provoking commentary in Forbes on Americans and their inability to save. The grim facts: After peaking at a peacetime high of 15% thirty years ago, the savings rate fell, plunging below 0% last year. Over the same period, the Boomers went from the start of their careers to near the end. All the while, life expectancies grew. You’d expect the savings rate to be trending up, not down. The nation didn’t stop saving because it finally built a solid nest egg. The median American household has just $37,000 in assets other than a home. Even those closest to retirement have surprisingly little saved–the oldest Boomers have about $180,000 to their credit. That’s nothing to sneeze at, but consider that $180,000 produces an income of just $750 a month. This entry was posted in Current Affairs on November 13, 2006 by auren. I am a huge proponent of HSAs and high deductible plans. They might single-handedly save health care in America. If you want to get a high-deductible plan in California and you are 30-34, you have two choices with Blue Shield — a $2400 deductible and a $4000 deductible. A $1600 difference (all the other items on the plan are the same). You’d think that the yearly premium would be fairly similar with the 2400 being a bit more expenses – maybe about $200 more. But here is where it gets crazy. The 4000 dues is $63/mo or $756/yr. So that means the 2400 Plan is $612 dollars more expensive than the 4000 Plan even though you only get a maximum of $1600 in additional coverage. That is a HUGE premium for that insurance. So if you are healthy, plan on being relatively healthy the next year, and are financially stable, you’d think it was in your obvious best interest to get the highest deductible possible. (by the way, this analysis is even more true for car insurance and other types of insurance). This entry was posted in Current Affairs on October 14, 2006 by auren. i rarely blog about politics even though i am passionate about it. but something is newsworthy. My friend Steve Poizner is running for California Insurance Commissioner (one of seven state-wide elected offices in California). Steve is a wonderful man, a dedicated public servant, and someone I think extremely highly of. Today, the Los Angeles Times endorsed Steve (see full text of the endorsement below). Steve has also been backed by the Oakland Tribune, Sacramento Bee, and other papers. he’s essentially the “good government candidate” in the race (his opponent is the infamous Cruz Bustamante). if you are in California, I encourage you to consider voting for Steve. Republican entrepreneur is a more competent and reliable consumer advocate than Cruz Bustamante. CALIFORNIA HAS ONLY HAD TWO elected insurance commissioners. First there was Democrat John Garamendi, who was seen as a champion of consumers, and then Republican Chuck Quackenbush, who resigned in disgrace amid allegations he allowed insurance companies to underpay their 1994 Northridge earthquake claims. Prosecutors never filed charges, but after two appointees filled out the term, voters returned Garamendi to the job in 2003. Now Garamendi is leaving again, and the fight is renewed between consumer advocates — who say the industry is out to cheat customers — and insurance companies, which say regulators don’t understand the market. Garamendi is backing Democratic Lt. Gov. Cruz Bustamante over Republican tycoon Steve Poizner. The twist is that the best choice for consumers, hands down, is Poizner. The Silicon Valley entrepreneur has solid market credentials, having built a billion-dollar company from a global positioning device that locates cellphone users for emergency operators. He has made reducing insurance fraud a priority, which would protect the industry but also would allow companies to offer lower prices to consumers. He acknowledges that “insurance companies want to own this position” — and he vows not to let them. He has said he’ll defend Garamendi’s auto insurance rate regulations, which put a person’s driving record ahead of where the driver lives. He vows to defend Proposition 103. He’s credible, and his history shows he’s a man of integrity. He thinks before he acts, a trait exemplified by his careful study of a liberal Democratic Bay Area Assembly district that he almost won, and his equally studious approach to and backing for Gov. Arnold Schwarzenegger’s redistricting reform, a measure that, while unsuccessful, was worthy. The insurance commissioner’s job, he notes, “requires analytical horsepower.” Poizner has it. Bustamante, as a legislator, often backed bills that insurance companies sought to help them avoid complying with Proposition 103. For example, he advocated the repeal of the initiative’s good-driver discount. When he ran for governor in the campaign to recall Gray Davis, he misused donations from Indian tribes and was heavily fined. As a candidate for insurance commissioner, he accepted insurer contributions, then returned them when it became a campaign issue. It was not a proud day for Democrats when it became clear that he would be their nominee. His election would be a step backward for consumers. Poizner is no Garamendi; with his market orientation, Poizner is open to permitting lower-premium health policies and other types of coverage with very high deductibles, along with other moves that may not prove popular with consumers. But he is dedicated to making sure insurers are competitive and, where the market falls short, he will be an effective consumer watchdog. This entry was posted in Current Affairs on October 4, 2006 by auren. In every presidential election from 1980 – 2020 (or 32 yrs), either a Clinton or a Bush will have been on the winning the presidential ticket. That makes us look like a development nation with a struggling democracy. Already a Bush or a Dole has been on the Republican presidential ticket since 1976 (28 yrs). And are we ready for a Chelsea Clinton vs George P Bush in 2032? (they’ll both be about 50 then). Do we really want presidential politics dominated by just a few families? This isn’t to say that a member of a family dynasty can’t be a good President. It is only to be very wary of concentrated power. Our founding fathers were very concerned about dynasties. It isn’t coincidence that out of our first five Presidents, only Adams had a son. And Adams was very telling. 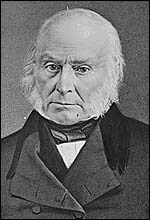 He was the only one of the first five Presidents to last only one term and, to prove the power of dynasties, his son, John Quincy Adams, became the sixth President. This entry was posted in Current Affairs on September 30, 2006 by auren.